Funny (and realistic!) facts about ‘Transport in La Paz’. Sharing today a bit of feedback on what we´re calling, “our newest home”. After being in La Paz, Bolivia, for a month, our overall experience is pretty positive, which is fantastic, considering we´re still waiting for our household effects to arrive, and kids don´t have a lot of toys to play with. All in all, very positive, and we`re enjoying every moment. Sharing today a bit of feedback on what we´re calling, “our newest home”. And thanks to Ailsa, from Where is my Backpack? for the usual inspiration! After being in La Paz, Bolivia, for over 4 months, our overall experience is pretty positive, which is fantastic, considering we´re still waiting for our household effects to arrive, and kids don´t have a lot of toys to play with. All in all, positive vibes, and we`re enjoying every moment. One thing that I find very ´peculiar´ is the traffic/transportation/driving dynamics here. Although, I shouldn´t, I suppose, after living and driving in Mozambique/South Africa/Swaziland, on the “wrong side” 😮 of the road, for some 3 years, and in Recife (Brazil), for another 2 years, nothing should come as a real surprise. But, in fact, there´s always something new at you. And, it actually makes me laugh on any regular day: not one single dull moment throughout this beautiful city here! I was quite happy to find a post that shared similar thoughts, and am adding it here, with a few comments. My appreciation to Strolling South America, another blogger with WordPress, for sharing actual/realistic and funny facts about the ´transportation´ in La Paz! I added my comments below each original statement. Have fun reading! This is the quickest option. I know it’s hard to believe, but some taxi drivers overcharge foreigners, so make sure you negotiate the price before you leave. The driver can tell you’re a foreigner even if you aren’t wearing stripey hippie pants and standing by Sagarnaga street. Also, make sure it’s a licensed taxi if you don’t want to risk getting EXPRESS KIDNAPPED. If you’re lucky, the front seat will have a seat belt. The back seats will not, but take comfort in the fact that the driver isn’t wearing one either as he passes on the right and runs red lights. Comment: Gotta love the taxis here. For a mom of 3 little ones, still waiting for our family car, I became quite dependent on taxis, know already a few companies/agencies, and even names of drivers. But the notion of strongly hugging/hauling your kids during any drive (especially the ones towards the downtown area, waving through the curves), is let´s say, exciting, but in not a great way! Something else about the taxis here: for some reason, they don´t have a meter (!! ), so, the driver has to inform the passenger about the cost. After a while, one gets to know how much a certain trip would cost, and we`re all good. But, going back to the ´lack of a meter situation´, according to one of my drivers (I´m becoming quite familiar with cab drivers here! ), there´s a simple explanation: THE ALTITUDE. That´s right! The high altitude of the city would ´damage´ any meter they tried to have installed… 😮 Believe it or not, the important thing is that cab drivers and their companies swear by this quasi-fact. That said, one has to trust their driver. You’re in the wrong city! Try Santiago, Buenos Aires, São Paulo or Rio de Janeiro. Comment: Haven´t had a chance yet… Let´s wait and see what impressions come out of that! Always wished you were a little bit taller? You won’t as your head hits the ceiling while the driver goes over a bump. More like a van than a bus, this is the most intimate of travel choices. Passengers often greet those seated with a “Buenas tardes” as they board. This is because they’re probably going to be cozily squeezed between a couple of them. Probably the safest of travel options as the driver has to frequently slow down to pick up passengers. No, there aren’t any seat belts, but if that’s what you’re looking for you’ll have to rent a car. Look at the sign in the front window to see where the bus is going. Failing that, listen for the fare collectors shouting the destinations out the open door. Despite the name, microbuses are actually the largest type of intra-city transport. Usually blue or yellow, they are bigger than minibuses, but smaller than your average bus back home. When the seats fill up it’s standing room only. This is the slowest and cheapest of transport options. I wouldn’t recommend it unless you’re really broke, or if you’re in a hurry and the minibuses and trufis are all full. This is really just a mini-bus disguised as a taxi. Trufis, which also advertise their destinations with a sign in the front window, run set routes like buses, the only difference is that they’re generally a bit faster as they don’t stop as often to let people on and off. They’re ever so slightly more expensive than mini-buses, but the difference is negligible unless you’re on a really tight budget. And if you are on a really tight budget, well you knew that this job only paid 30 bolivianos an hour when you signed up. It was nice knowing you. It’s honestly safer to cycle on this road. ok, ok… this is actually mountain biking… got a couple friends who’ve got a biking/sports business, so, biking is definitely part of my “TO DO” list while here! Comment: Well… I´m actually looking forward to try that, despite a few warnings about biking in the city… Don´t have a bike yet, but it´s part of my plans… Kids need to get their bikes, as well, so, I´ll try to be a good role model, reminding myself from my biking-to-work days in Davis, CA. Again, let´s wait to see what the future brings, but so far, I´m up for the challenge. La Paz is a great city in which to take a stroll if you’re training for the Olympics. The altitude combined with the hills will put you in peak physical condition, which you’ll need to fight off food poisoning. The cobblestone streets can be slippery, so I wouldn’t recommend parkour. Keep in mind that crosswalks are merely for decoration. 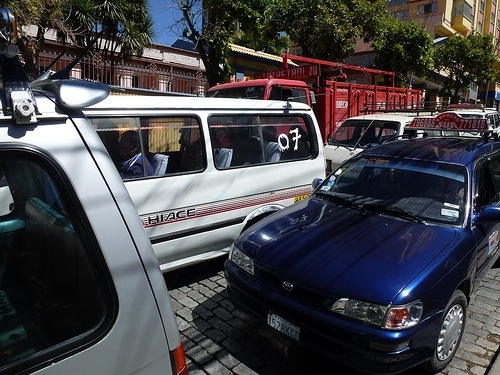 I miss the La Paz traffic…Santiago has so much REAL traffic…takes forever to get across town. By the way I NEVER rode bike in La Paz…I was terrified…more power to you. Luka also never learned because we didn’t have a street for him to practice on…always had to go to a park. They don’t know how to drive with bikes on the street. Be careful! Here Luka learned after 3 days of training. Thank you very much for the nomination, Catherine! 😮 Much appreciated! Thanks Marcia! Who knows? Maybe one day Panama will be on our bidding list!!! 😮 Thank you for stopping by! The minibus ones have much in common with the African jobs – except that I doubt any driver there has managed to get the impossible 113 people (OK, mainly kids) into one. No, not a Microbus – just one of the glorified Combi-types! If one is going to overload, do it in style! hahaha brill, it sounds like a drive through Lagos! Thank you very much for the nomination! It’s good to be “inspiring”… 😮 Glad you liked it! Next Next post: How sweet! The Super Sweet Blogging Award!